This year, I am posting it early enough for you to get chalk if you don't have any in the house. 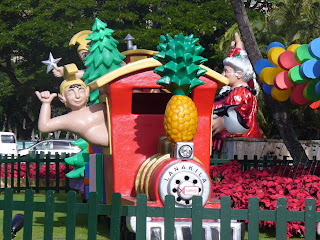 Mahalo to my friend Becca for sharing this with me last year. Pope Benedict is considering bringing back the prayer to Saint Michael. According to Father Amorth (the Vatican's chief exorcist), Pope Benedict is considering bringing back the prayer to St Michael: “I remember a meeting we exorcists had with the Holy Father last year, in which he implored us to follow our mission as exorcists,” the Telegraph quoted him as saying. Father Amorth has also revealed that the Pope is contemplating reinstating use of the prayer said to Saint Michael the Archangel, which was abolished in the 1960s, because it is believed to be the prime protector against evil." 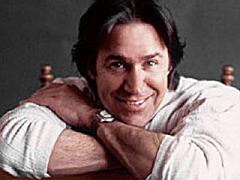 Be sure to visit Ed's blog for the links to the accompanying articles. Gracious Father, Saint Thomas was famed for his opulence and his status as the most powerful man in England second to the king. Everything changed when he became a priest to be consecrated archbishop. He completely turned his life around and began to live piously. He was soon opposing the king to defend the Church's rights. I ask him to pray for the conversion of our politicians today. O Lord, give them motivation to turn away from the love of money and prestige and to begin serving Your kingdom more than their earthly domains. Forgive them their sins and lead them to heaven. Saint Thomas, pray for us. Amen. This would be a good time to read Murder in the Cathedral by T.S. Eliot and/or watch Becket with Richard Burton. 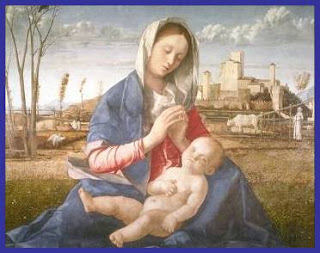 It is impossible for Herod's henchmen to recognize with absolute certainty, among all the babies of Bethlehem and its vicinity, just which infant boy is Jesus Christ. Thus, seething with diabolical fury, Herod orders the massacre of all who resemble Jesus in gender and approximate age. This barbaric case of "mistaken identify" becomes the source of incomparable exaltation for the Holy Innocents. For there is no greater glory than for a person to be mistaken for Christ himself. Perhaps the Lord had this in mind later in life when he declares that only those who change and become like little children can enter the kingdom of God. In our childlikeness, we are most like Jesus Christ. The blood of the Son Jesus that cleanses us fro all sin beings to reach us and transforms us today in a powerful way through the blood of the martyred Holy Innocents. 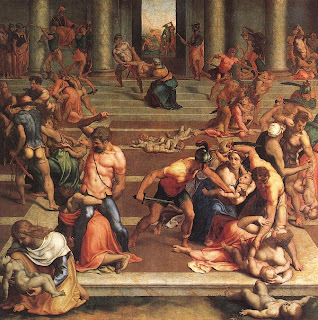 On this feast day, let us remember the present day massacre of the holy innocents through the crime of abortion. a name made famous by your heroic virtues. Help me never to do anything to besmirch it. I may initiate your Lord and Master, Jesus Christ. and bring me safe to my heavenly home at my death. Christmas was the beginning of "one world". Like His heavenly Father, Jesus, would have a chosen race-all mankind in the Catholic Church. The Church, to all appearances a mere organization, is really an organism-The Mystical Body of Christ, a Body living and breathing the life of God by grace. The cells of this Body are men, and it is meant to grow to "The fullness of Christ." That is why Jesus, the Head of the Mystical Body, did not come to earth full grown out of the clouds, but was born a Child. Purity of mind and body is a personal precept and a social virtue. But it is much more. It is a bulwark of the Kingdom of God on earth. From Fr. Patrick Peyton's Rosary Prayer Book. A cup of love goes in too. I'm making it just for you. And saving my soul from Hell. I'll add a cup of "glad" and "thankfuls"
Will enter in that pearly gate. And offer it to my King. I haven't any other thing. 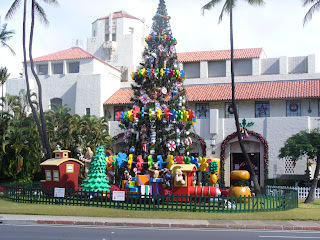 Did you ever wonder what the Christmas tree, candy cane, wreath, etc. have to do with Christmas? Much of the Christian meaning behind the symbols of Christmas has faded from the memory of our society. Each symbol has had a fascinating and interesting beginning. 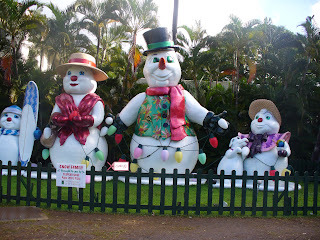 Christmas decorations were symbols of Christ in our homes and hearts. It is up to all of us to hand these symbols down to our children and children's children before they are lost in our deeply materialistic society. The word "Christmas" is a word that we hear and see often through the season, yet many are hardly aware of its origin. 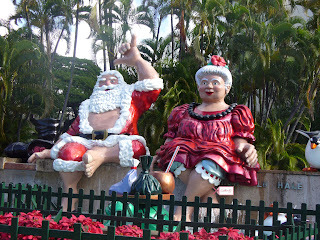 Christmas is a combination of two Latin words: Christus and missus. These two words mean: Christ is sent. Sent where? Into the world by the loving Father who wishes to give His children the most precious gift of all - His only Son. For centuries the Christmas tree all lit up has brought joy and peace to millions of homes each season. There are several stories about the origin of the Christmas tree. 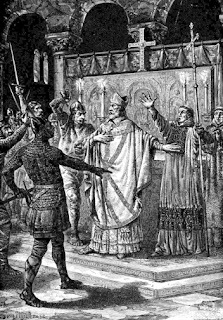 One story tells of the first Christmas tree shown in a miracle to an English missionary, Winfrid, later called St. Boniface. In the seventh century, while traveling through northern Germany, he came upon a group of people worshiping a sacred oak tree. He stood among the heathens and tried to convince them to stop worshiping the oak tree. He cut it down and as it fell to the earth it split into four parts and a young fir tree grew from the center. He told the people that this was the holy tree of life because it pointed toward heaven. He said, "Let this be called the tree of the Christ Child." The tradition of the Christmas tree was brought to this country by immigrants from Germany. The tree is an "evergreen" and is one of the few trees that does not loose its leaves in winter. For this reason it is a symbol of everlasting life, the precious gift from Jesus to all believers. There is even a Christmas tree displayed in St. Peter's Square during the Holy Season celebrating the birth of Christ. The Germans were probably the first to decorate Christmas trees. They used lit candles, nuts, candies wrapped in bright paper, fruits, toys, angels and stars. 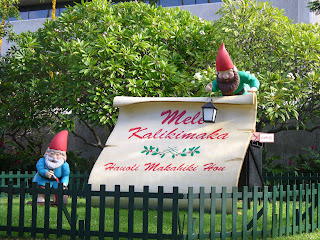 The Scandinavians trimmed their trees with little flags, then later also used nuts, apples and cookies. Candles have long been a part of the tradition of the Church. At Baptism the parents of the child are handed a small white candle and told: "receive the Light of Christ, may you keep the flame of faith burning brightly on this child who is a new creation." The candles we burn brightly at Christmas remind us of our own Baptism and our own adoption as God's children. They equally symbolize Christ who is our Light in the darkness. At a wedding there is a candle ceremony whereby the mothers of the bride and groom come to the altar with a lit candle and present them to their children who are to be married. They receive the candles and light one candle on the altar showing they are soon to be united as one. The star is one of the most popular symbols of Christmas. 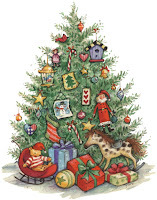 Many people top their tree with a star or place a star that is brightly lit over their homes. 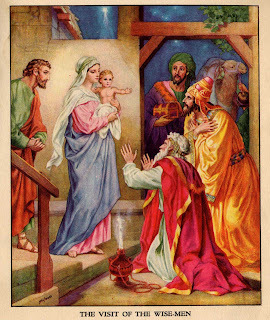 It was the star which led the Magi to the humble crib of the new born King. The Magi were the first non-Jewish people to visit Christ and they represented all people outside of the nation of Israel. The star reminds us that we are invited to come to Christ and to offer our gifts and talents to Him. The Christmas Star is God's invitation to offer ourselves to the Father of all people and nations and to adore Him. School bells call children to classrooms and church bells call millions of people to worship. Bells alert people to important happenings, saying: "listen, take notice!" Bells are also a favorite symbol of Christmas. "Silver Bells," "The Bells of St. Mary," and the little bell on the Christmas tree in the move "It's a Wonderful Life," are all part of our Christmas tradition. The bells of Christmas have a special meaning, for they sing out: "your Savior is at hand, your freedom from sin is here!" What a joyous message, what a beautiful sound! Santa Claus seems to overshadow the true meaning of Christmas and there is a sad irony in this since he is really Saint Nicholas. 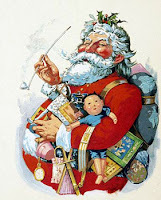 During the 4th Century, St. Nicholas, a bishop of Turkey, was the real Santa Claus. According to legend, he would drop a bag of gold coins down the chimney into a stocking which a poor girl had hung by the fireplace to dry. Hence we have acquired the custom of hanging the Christmas stocking. He was generous to the poor and always gave gifts secretly. In imitation of him anonymous gift-giving at Christmas time began. 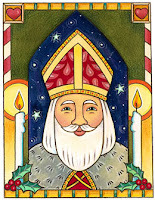 In his life, Saint Nicholas reflected God's gift of grace to all. Today, this beautiful tradition has been grossly commercialized. All is not lost however, if we take the time to explain the Christian origin of this great historic figure we call Santa Claus. In ancient Rome and Greece, athletes and heroes were rewarded with wreaths as trophies in sports or military battle. "To the victor goes the crown" meant that the winners received a wreath and were paraded before the people. 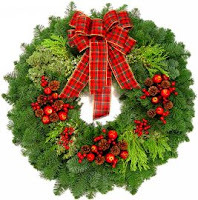 Christ's victory over evil on the cross is also symbolized by a wreath. As Christians, we are reminded of the crown He wore, how He was paraded through the streets of Jerusalem for all to see and how He struggled with sin and death on the cross. 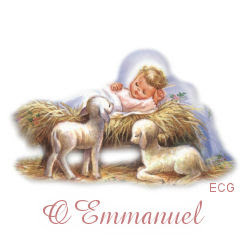 On that sacred night when Jesus was born, in a stable near the hillside of Bethlehem, some shepherds were invited by the Angel to go and see the newborn Messiah of Israel. 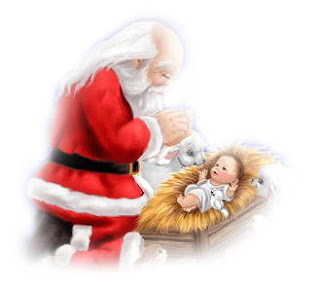 After Mary and Joseph, they were the first people on earth to adore this Infant Savior. Their crooked shepherd staffs have been memorialized in the candy canes which decorate our Christmas trees and fill the stockings of children. Decorating the Christmas tree with ornaments comes from an old European custom when ornaments were made from cookies and bread. These were hung on the tree in thanks for "our daily bread." They meant a special Christmas treat for the children, too. Through the years these edible decorations began to be made of carved wood and blown glass. The tradition of edible decorations is still carried on when we give and share special Christmas breads and foods with friends and relatives. 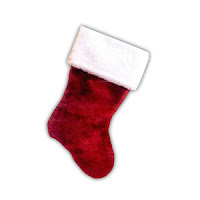 We often use apples to stuff children's Christmas stockings and to hang on our Christmas trees as decorations. 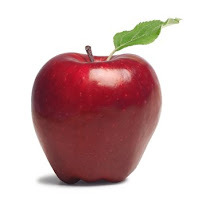 Yet few of us realize that the apple also has a Christian meaning. It stands for the forbidden fruit that Adam and Eve ate in the garden of Paradise and therefore, the first sin and the sin of all humanity. Although the apple recalls this sad event, it also reminds us of the happy outcome - the good news that Christ is the new Adam who has saved us from sin. Christmas carols go back to St. Francis. A "carol" signified a dance rather than a song. It was St. Francis who led the people in joyous dancing around the Nativity scene. 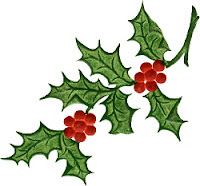 Garlands and sprigs of holly are used to adorn our homes, churches and public places. The colorful green leaves and red berries bring an air of festivity, yet they bear a deeper message than simple decoration. Long ago, the sharp thorns and red berries reminded Christians of the suffering for which the Infant Messiah was destined. They saw in the thorns the crown which would pierce His head. The berries reminded them of the blood He would shed. Red and green are the colors most used at Christmas time. In the tradition of the Church these colors have special meaning. Red symbolizes the blood of Christ and the martyrs who loved God and remained faithful to Him. Green is the color of hope and has always been a sign of life and growth in nature. Love and hope are very much a part of the Christmas story, for God became human to prove His deep love for us and give us hope of eternal life. The Christmas Seal was started in 1903 by Anton Holmboe, a Danish postal clerk. It was started as a source of revenue for an anti-tuberculosis society. The exchange of Christmas cards began in England in the 1800's. They were first introduced in the United States by Louis Prang, a German immigrant who settled in Massachusetts. Prang, called the "Father of the American Christmas Card", printed the first "Season's Greetings" in 1873. My friend Mary Ann of Friends of the Poor Souls shared the following with me a few months ago. Click above link to read the homily in its entirety. Pictured shared by Sue Cifelli. O Mother of Jesus, and my Mother, let me dwell with you, cling to you and love you with ever-increasing love. I promise the honor, love and trust of a child. 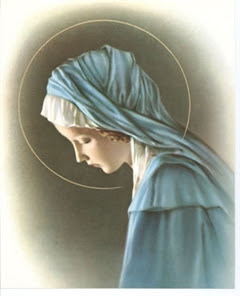 Give me a mother's protection, for I need your watchful care. You know better than any other the thoughts and desires of the Sacred Heart. Keep constantly before my mind the same thoughts, the same desires, that my heart may be filled with zeal for the interests of the Sacred Heart of your Divine Son. Instill in me a love of all that is noble, that I may no longer be easily turned to selfishness. Help me, dearest Mother, to acquire the virtues that God wants of me: to forget myself always, to work solely for him, without fear of sacrifice. I shall always rely on your help to be what Jesus wants me to be. I am his; I am yours, my good Mother! 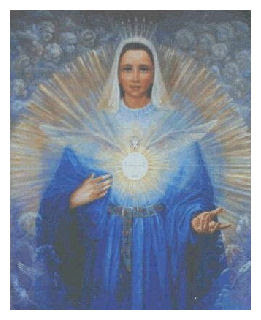 Give me each day your holy and maternal blessing until my last evening on earth, when your Immaculate Heart will present me to the heart of Jesus in heaven, there to love and bless you and your divine Son for all eternity. Prayer is from Concordia Ministries, a wonderful Catholic site I found today. Check out their Silence area. 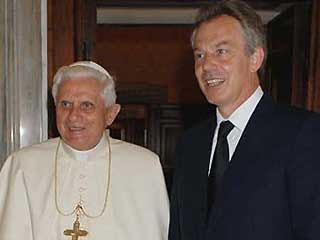 LONDON — Former Prime Minister Tony Blair, who generally kept his religious views private while in office, has converted to Catholicism, church officials said Saturday. There is so much controversy these days about this simple greeting, because it seems to make Christmas little more than a secular holiday. Few would deny the holiday’s historical roots in Christianity, but there is a prevailing attitude that the holiday has “matured” into a day for believer and non-believer alike. Christ is no longer the center of the observance for many. While it would be easy for us to rail against this contemporary bow to secularism, we might also be challenged to scrutinize our own attitudes about our faith and ask if we ourselves have not planted the seeds of the separation of Christ from Christmas. Is our faith in Jesus simply belief in a historical person who lived an exemplary life, who died a sacrificial death, and who left us a legacy of teachings to guide us in life’s journey? Or do we also truly believe that Christ IS risen, that he is alive now, and that, even though he has ascended into heaven, he comes physically to earth as the living bread come down from heaven in the Eucharist? Do we go to the Eucharist simply out of obligation or tradition, or do we go to encounter the Lord of our lives? Do we view the Eucharist only as a series of rituals, or as an encounter with a living person whose love can transform us? Do we truly believe that the little Babe laid in a feeding box in Bethlehem, whose birth stirs up so much joy in us, is the same Jesus who is laid on the altar to feed his sheep today? Can we be filled with the wonder and awe of those down-to-earth shepherds who witnessed heaven singing to celebrate the joy of God-become-man? When we go to Mass do we find the experience dull or dreary unless the choir or the homilist brightens it up for us, or do we go with stars in our own eyes, stars that guide us to adore the King of heaven and earth? When we leave after having received the Eucharist, do we grasp the incredible wonder that the same Jesus who was carried in the womb of the Virgin until she brought him forth to the world is carried in us so that we can bring him forth in today’s world? Yes, we should prefer “Merry Christmas” to “Happy Holidays” because it is more expressive of the truth we are celebrating. But “Merry Christmas” will only regain its meaning if we live the reality and not just the words. “The Word was made flesh and dwelt among us.” The same Word takes flesh in us today, so that he can continue to touch the hearts of believer and non-believer alike. Can you see the star? Can you hear the angels singing? 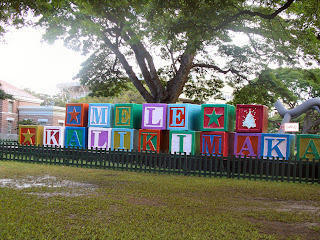 Mahalo Bishop Silva, for reminding us, your flock, of the true meaning of Christmas. The following is from the Imitation of Christ by Thomas A Kempis. I thought this was a good time to post this as we should all be purging our sins through the Sacrament of Confession prior to Christmas. -where the envious souls go howling like mad dogs, for very grief! Spend a hundred years of penance here on earth, it would be no match for one hour of that punishment. Here we have intervals of rest, and our friends can comfort us; there is no respite for the damned, no consolation for the damned. Take your sins seriously NOW, be sorry for them NOW, and at the Day of Judgment you will have confidence, the confidence of blessed souls. -it will be the turn of the wicked to look foolish. -how the gilded palace shrinks into insignificance beside the poor man's cottage! -The devout prayers you offered, not the good meals you ate, will be your comfort then. -Saintly deeds done, not phrases neatly turned, will avail you then. -A well-disciplined life of hard penitential exercise, not a good time here on earth, will be your choice then. Love God with all your heart, and you've nothing to fear; death or punishment, judgment or hell; love, when it reaches its full growth, is an unfailing passport to God's presence...Only, if a man doesn't make the fear of God his final consideration, his good resolutions won't last; he will walk into some trap of the devil's before long." The following story was shared by my friend Chris S. I hope you take the time to read it to the end. 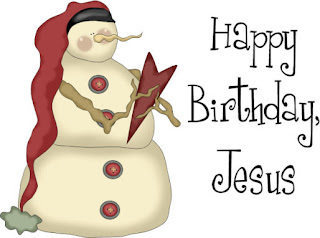 It first appeared on Christmas Day, 2005. Navy Reserve chaplain Ron Camarda didn't want to go to Iraq. But go he did, writing in his journal the names of the 2,000 troops -- some dead, many wounded -- he met along the way. His experience changed him and his message for the holiday. To start to understand what happened last Christmas -- how a Catholic priest from Jacksonville ended up standing in an eighth-floor lookout in Fallujah, Iraq, singing Oh Holy Night with a Marine, tears streaming down both of their faces -- first you have to hear the other stories about the tears. As performed by Josh Groban. 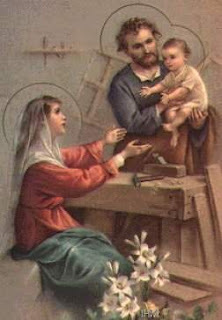 The Blessed Virgin did not speak many words. She remained silent in the adoration of her Son; she lived on the contemplation of the ineffable mystery wrought in her and through her, and from the sanctuary of her Immaculate Heart a hymn of praise and thanksgiving rose up unceasingly to God. Let us then live in recollection and try to remain closely united to our Lord. Look what I found at the Anchoress's blog! I wish I had seen this earlier, it would have been on my Christmas wish list. You know I love the Archbishop! I used some of the quotes for the Three Priests video. 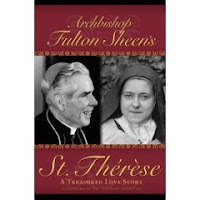 And, speaking of Archbishop Sheen, remember his Family Retreat talks? Well, only one word to describe them........EXCELLENT!!! Last night's talk was on Confession. It was filled with anecdotes and compelling stories of people who were changed through the Sacrament of Confession. A few other of my favorites and ones I will watch again are The Devil, Kenosis and The Cross. "Thus saith the Lord of hosts: The fast of the fourth month, and the fast of the fifth, and the fast of the seventh, and the fast of the tenth shall be to the house of Juda, joy, and gladness, and great solemnities: only love ye truth and peace." "Drop down dew, ye heavens, from above, and let the clouds rain the Just: let the earth be opened and bud forth a Savior. The heavens show forth the glory of God: and the firmament declareth the work of His hands"